Wealth - Coaching and Leadership International Inc.
Of particular note here is a corollary of the Universal of Cause and Effect which says "the more we give away, the more we will receive." Ask your Power Coach� to coach and mentor you on wealth which includes investments, debt reduction, assets, real estate and possessions. Your Power Coach can assist you in determining and removing the emotional, intellectual and spiritual roadblocks you might have to the accumulation of wealth. 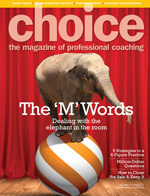 Choose Your CLI Power Coach� or Book a Power Coach now. "My greatest learning has been to be able to work through personal fears and doubts as they arise about my abilities to effectively support myself and others who are deeply interested in personal/global healing and purposeful living."